This Baguazhang healing method is also called “Nine by Nine” technique as it is formed by nine series of movements (each series includes nine movements). I have been using this method in addition to Baguazhang basic training since 1992-1993 and after more than 15 years of experience, I can confirm the very good health benefits that Nine by Nine Technique can bring to internal and external martial artists as well as people under medical treatment. Minimum uninterrupted training period: 30 days in order to get it most beneficial results. In January 1992, I went to the hospital after noticing uncomfortable sensations in the waist area, results from CT (Computed Tomography is a specialized X-ray imaging technique）analysis came out: I had a herniated nucleus pulposus which is a slipped disk along the spinal cord. The condition occurs when all or part of the soft center of a spinal disk is forced through a weakened part of the disk and oppressing lumbar nerves. In fact at that time it was very painful in both legs and I noticed muscles fast atrophy of my lower limbs, loss of control in bowel and bladder functions: I was strongly advised to undergo rapidly a surgical operation or it will be caused a general lower limbs paralysis. Operation: The surgery was to remove at the fourth lumbar disk protruding gelatinous substance. But as parts of lumbar nerve roots (large nerves that branch out from the spinal cord) were severely damaged after compression: after operation it appears further neurological symptoms, such as sensory or motor changes. Although after operation pain in both legs disappeared, but below the buttocks level I could only feel numbness and nothing else. All movements in waist area requesting a very intense conscious control of all waist muscles: for example in sitting where did not have any other sensation, inability in differentiating bower and bladder functions, both ankles were semi-paralyzed. When the doctor told me that I could not anymore practice Wushu it was another very painful situation. Wushu was part of my life: I started Wushu at 8 years and never stopped until undergoing operation: after more than 30 years of uninterrupted practice, how can I suddenly stop reaching just a middle age? What about my students? First period was rather struggling against pain, then I had in mind the dream to reeducate myself progressively to recover the use of my lower limbs. Three months after the surgery, I left the hospital and started to reeducate my lower limbs. My first objective was regaining power. Helping myself with a solid thick stick I started squatting exercises and gradually increase the quantity of physical effort involved in. In addition with acupuncture treatment, after half year I regained feeling sensations in my lower limbs slowly have feeling, then I started to be able to put more weight on legs and progressively restarted to walk in circle. Later although I recovered quite successfully the motor function of lower limbs, but my waist was still not able to apply any power, being nothing but ankylosis and clumsiness. First achieve complete relaxation of waist. To reach this aim I started post standing. When I was able to stand during a sufficient time, my waist was naturally starting to sway again. This first sign of progress was very helpful for me to continue my reeducation with post standing. As I persevered in its practice with time it induces increasing degrees of rotation in various part of the spine: neck, dorsal, lumbar, hipbones and even pelvic cavity all started after to turn again and regain their normal motor ability. My waist movements were gradually increased while after surgical operation pains were decreasing day after day. I felt also that all internal organs in waist level were getting stronger and stronger, leading me progressively to a full recovery of my digestive. After one year, I was able to resume basically the normal training course of Baguazhang. in 1995 I won a Superior Award in the Second International Baguazhang Competition and during three years consecutively achieved excellent performance at the Beijing Traditional Wushu Competition. I hope that these exercises will also help any practitioner to strengthen their body or support them to dispel disease. Both legs naturally shoulder wide separated, both hands naturally placed according to each one’s comfort: palms placed on the belly or placed on your lower back at waist level or simply alongside the body. In any case drop your elbows, deplete your chest while bending it forward and stretching back, uplift neck and erect head, the tongue touching the palate, both eyes slightly closed. Two special focuses in this exercise: 1. Keep whole body relaxed, 2. Keep heart and mind quiet (mental centered in the belly). Focus your mind on the coccyx area, use your mind to keep it upright and pointing downward as prolonging down to the ground— this forms an imaginary line that will touch the ground at a reference point. Now this is your referential center point, use your waist to draw imaginary circles around and increase progressively the diameter of these circles. Both legs are naturally stretching in your post (avoid from too straight stance). Do this exercise clockwise and counterclockwise: nine series of nine circles each (totaling eighty-one circles each). The mind placed on Huiyin point descending down to the ground—this forms an imaginary line which will touch the ground at referential point; with this referential ground point as the center, draw imaginary circles around it on the ground. These circles should be fit in the space between your two feet. Now imagine that your both legs are part of a large container, the line starting from Huiyin upright as a churn stick which will progressively mix uniformly all the liquid contained. Keep on drawing perfect. 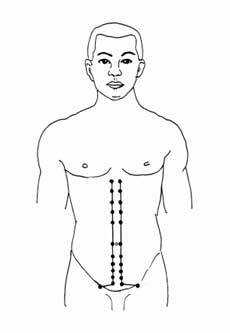 This section will help you to acquire more autonomy and dexterity in lumbar, dorsal vertebra and neck area. 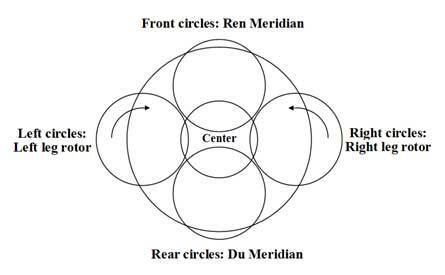 The mind on the pubis area, extend the dropping feeling vertically down to the ground— this forms an imaginary line which will touch the ground at referential point; with this referential ground point as the center, draw imaginary circles around it on the ground. In this section buttocks are slightly shifting forward, both legs stretching naturally. With left leg as a big rotor do circles clockwise eighty-one times. With right leg as a big rotor do circles counterclockwise eighty-one times. Image now your two legs connected by a string, draw a continuous “S” contained in the same plane parallel to the ground. Imagine a plane parallel to the ground at the level of your upper abdomen and another vertical plan dividing your body perfectly in half between your eyes, the intersection of both plans will result a line. Draw circles with this line while keeping it always parallel to the ground. Imagine a vertical line, connecting head and Huiyin, intersecting in the middle of previous line (Section 6). Draw imaginary vertical cylinders around the initial line. Use your whole waist to draw, as in Section 6, imaginary vertical cylinders but this time naturally large ones. Two legs naturally straight, uplift heels, suddenly drop them onto the ground, as a result it will shake slightly your body and especially your internal organs. This requires you to have a whole body relaxed. Shake your whole body for a total of eighty-one times. Proceed now to the end of the exercises, both hands placed on the belly (right hand on left hand for man and inverse for woman), hold your standing post for a little while (according to your own appreciation). And after rub two hands with each other, until they are getting hot, use your palms to cover slightly both eyes. Open both eyes and drop slowly your arms to return to the preparation posture. Taoist healing and health methods are all inspired from the concept of “Universe and human body merging into one single entity”. Ancient Chinese through their contemplation of Heaven, Earth and surrounding Nature assimilated human body a small universe itself. This small universe should be close relation with the Cosmic Universe, regarding the Laws which govern its development and mutation. According to Traditional Chinese philosophy you can find Heaven, Earth, Wind, Thunder, Mountain, Lac, water and fire: Eight symbolic entities, changing and struggling with each other: they are represented in human body by the Eight Extraordinary Meridian energetic activities. If these Eight Extraordinary Meridians are active and fully flowing, then the human body is healthy and away from disease, but if they are weak and present obstruction in their flow, then the human body will gradually degenerate. 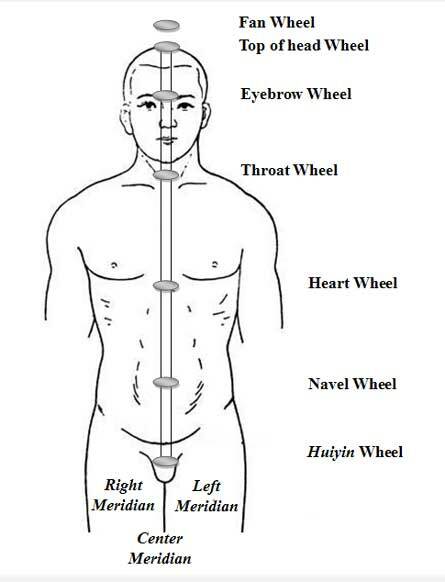 Taoist Health cultivation methods are mainly using Eight Extraordinary Meridians and especially the Du and Ren two meridians which are the most important ones (Fig.1 and Fig. 4). Inspired by the “Mi Zong” method (Secret Buddhist sect) which is mainly cultivating the body according to the Three meridians and Seven Wheels (see next paragraph). 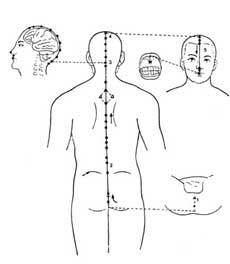 - Three Meridians: they are not related to acupuncture meridians but rather to the whole anatomy of the body. Left meridian is being the center meridian of left leg and Right meridian the center meridian of the right leg. 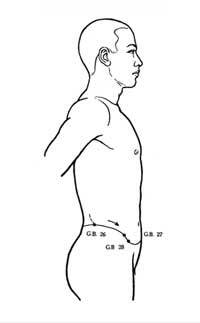 The Middle Meridian is the body’s trunk center meridian. - Seven Wheels: Having their center on the same imaginary line starting Fan acu-point (called generally Bai Hui in TCM) down to Huiyin acu-point, Seven Wheels are seven main parallel sections of the body. The highest is “Fan acu-point”, followed by “Top of the head Wheel”, “Eyebrow Wheel”, “Throat Wheel”, “Heart Wheel”, “Navel Wheel” and “Huiyin Wheel”. According to the Mi Zong theory if the Three meridians and Seven Wheels are opened then the body will remain healthy during a long life. With these previous principles you can now consult again the nine sections of Practical method and deepen each part of the exercise and its meaning (the title of each section will help you to apprehend its most important meaning.